In response to this trend, Coach Meharg and her staff have developed a three-station technical circuit that focuses on developing the core skills and cognitive focus needed for players to be successful. Players are filmed to review their skills for correction and refinement. They will then repeat the drills, applying the noted corrections to strengthen their fundamentals and decrease the time it takes to move through the drills. The second station reinforces the necessary mechanics for ball control. There are 100 ball control skills to work on in three segments that increase stick skill speed vital to on-ball field awareness and 1v1 elimination skills. Coach Dina Rizzo takes the players through the third station, Skills and Tactics. You'll see a 4v2 Possession game that works on receiving, passing, vision and ball control. Other drills include Short Passing to Goal and 5v2 Full Court. The circuit training evolves into intense progressive games that work on both skill enhancement and endurance. The coaching staff takes the skills worked on in the three parts of the technical circuit training and puts them together into a tactical progression numbers team game. The concept of transitioning from defense to offense using movement and communication is the focus. The team trains with yoga instructor Jessie Hill, a former University of Maryland Track & Field Athlete. Yoga helps maximize individual balance, flexibility and strength in field hockey-specific movements. The yoga is not only used for improving bodies, but also teaches how to relax and perform under mental stress. 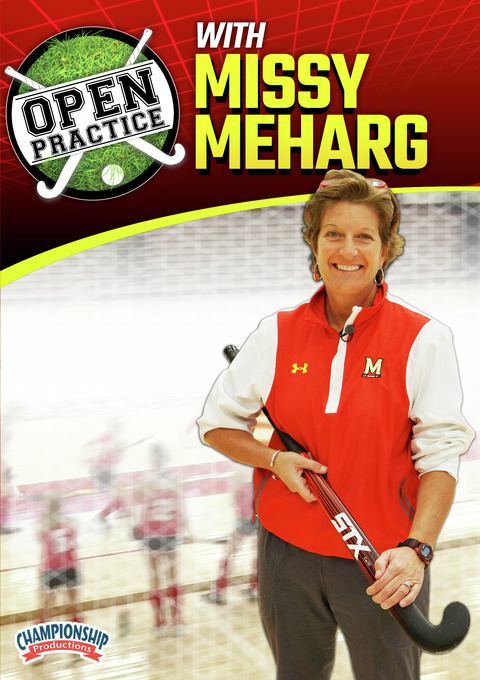 Coach Meharg helps you to structure an indoor program designed to get the most out of your players - both physically and mentally.